In April 1999 I decided to participate in the last Marathon of the 20th century in Berlin . I had exactly 5 months for my preparation. As always I made it all alone. No proper training plan, no assists from fellow runners. Only my friend Juan decided to join. In late September we both travelled to Berlin and stayed with my brother Klaus. On Saturday, against all recommendations Juan and I made a hard run in the woods ofBrandenburg, which was a mistake. You should not run hard in the week before a Marathon. But nobody told as. As the race started on Sunday morning, I felt very well and run the first 10km in 1:02:08, second 10kn even faster in 1:00:23, so everything went well. The third 10km took me 1:06:57. But than rain started and I got an gout attack in my left great toe. For the fourth 10km I needed 1:15:28. For the finishing part, 2.2km 0:24:10. But I made it. To my surprise, when I reached the finishing line, my friend Juan was already there. How was that possible? I overtook him, I was sure. Simple explanation, he took the subway to finish the last 25kms. 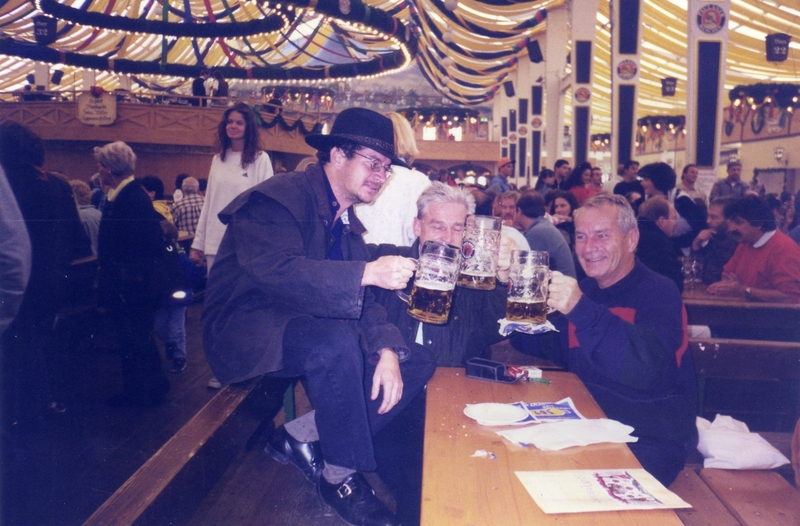 The picture below, on the left shows our victory celebration in Munic, at the Octoberfest. This event is very valuable for me, it showed practically myself, not enough training, wrong preparation but at the end I finished it. There are many paraellels in my life. I always hav e the tendency to sub use my abilities, cause by ignorance or being gifted to much. After having such an sucess after my first marathon, I decided to run next year again, more prepared, looking for training partners in Costa Rica. All my good intentions have been in vain. On the 28th of July, 2000, I suffered a very bad Motorcycle accident. I nearly lost my right leg. 3 month in plaster, not recognized knee troubles, going back to Germany, being operated again. I stayed a total of 4 month in Heidelberg, becoming slowly aware that my runners carrier was finished. Or not?